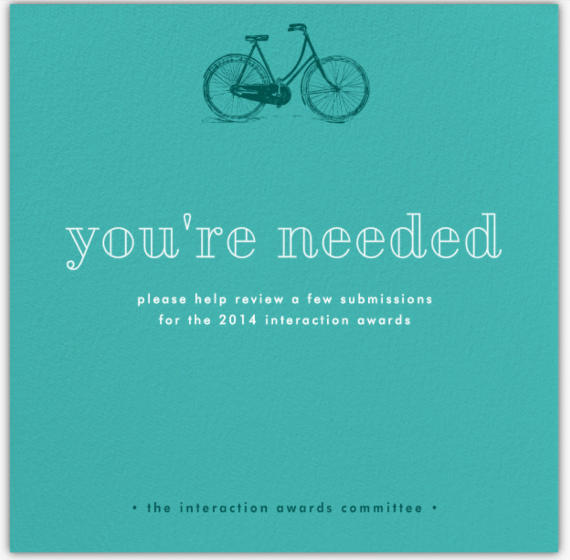 A critical part of the Interaction Awards is the Peer Review process. Rather than having the jury evaluate all entries (which could never happen in a weekend), we ask designers and colleagues from around the world to share their time with us and to review 5 or more entries. Our goal is to have each entry viewed by a minimum of three people. Wondering how the entries are evaluated? Each entry was asked to provide information about Opportunity, Audience, Impact and Craft. They also have an opportunity to provide some images and a video to bring the project to life. We ask our Peer Reviewers to rate them along the same dimensions, while taking care to evaluate the project in and of itself, not comparatively across the entries. In the submission, we asked: Looking at the driving force behind the project, what challenge or opportunity is the project addressing? Is the intent clear? Peer reviewers are asked: How well did the team identify the opportunity & intent of the project? In the submission, we asked: How well did the project team understand the people most impacted by the project –its intended audience– and design for that audience? In what contexts is this product or service to be used? Peer reviewers are asked: How well did the team demonstrate understanding of the audience, their contexts of use, and design for that? In the submission, we asked: How well did the project deliver on its intended impact, against the challenge at hand (opportunity addressed), the audience (needs & behavior addressed), and the business (profit, cost, brand)? Peer reviewers are asked: How well did the team deliver on its intended impact? In the submission, we asked: How well did the project team convey their design process? How well did the final project demonstrate its elegance in language, functionality, and use, as it supports human interaction? How well does the final project demonstrate attention to detail, fit and finish, and how the chosen medium serves the purpose and goals of the design? Peer reviewers are asked: How well did the team demonstrate craft? The Peer Review process will help us narrow down the body of work to 12 per category, making up 72 shortlisted entries that will be taken into the Jury Weekend. We will announce the shortlist by November 1. All shortlisted entries will be eligible for the People’s Choice process, opening January 2014. Thank you again to all who have entered! We are privileged to hear the stories you are sharing, and we cannot wait to bring that back out to the community.